← you know what? I don’t wanna know! I know this picture is a bit blurry, but without the flash the color of the yarn comes through. I have been wanting to knit this project ever since my friend Flair knit one up. 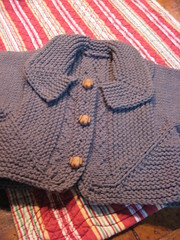 The construction is interesting – knit from each sleeve toward the center line and then kitchenered up the back! I have also been attempting to knit from my stash and I have lots of Cotton Ease, so there could be a few more of these in my knitting future. When in between big projects, my grandmother often knit up a baby something-or-other to have on hand for gift giving and I think that is a good idea. It is also a great way to knit from the stash! You may notice in the button close up that I put in five button holes, but I am only using three — I need to sew up the other two. 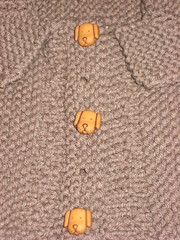 The puppy buttons were perfect, but five was overkill. Did you all have a nice Mother’s Day? Mr. Boar and I went plant/yard shopping and bought ourselves a new gardening toy. A gas powered edging tool that will take attachments! So we bought ourselves the rototilling attachment and also the weed whacking attachment. OMG I am in love with that rototiller! That thing has made mincemeat of some back-breaking labor — I got all of my veggie beds turned over and also extended a garden that has been on my mind. Yay for power equipment for Mother’s Day! (I also got a plant and some chocolates from the Ds). Only you would love power equipment for mother’s day, lol! Aw, what a cute cute sweater! Love the sweater. I’m into the power equipment too!! !